Kids will enjoy Bahia Honda State Park and All Aboard Boat Rentals. 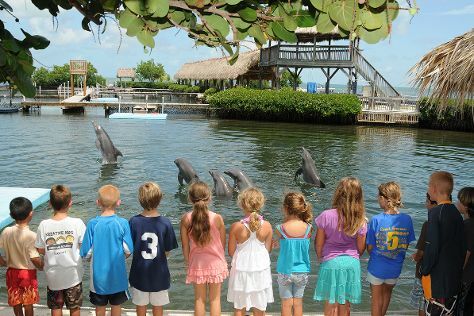 Eschew the tourist crowds and head to Kayaking & Canoeing and Dolphin Research Center. Change things up with a short trip to Robbie's of Islamorada in Islamorada (about 44 minutes away). Next up on the itinerary: identify plant and animal life at The Turtle Hospital and tour the pleasant surroundings at Sombrero Beach. For maps, traveler tips, ratings, and more tourist information, read Marathon itinerary planner. Indianapolis to Marathon is an approximately 8-hour combination of flight and shuttle. You can also drive; or take a bus. Traveling from Indianapolis in March, things will get much hotter in Marathon: highs are around 81°F and lows about 69°F. Wrap up your sightseeing on the 27th (Mon) early enough to drive to Key West. On the 27th (Mon), identify plant and animal life at Key West Butterfly & Nature Conservatory, get engrossed in the history at Truman Little White House, then kick back and relax at Fort Zachary Taylor, and finally make a trip to Duval Street. Here are some ideas for day two: add some adventure to your tour with a kayaking and canoeing tour. To see ratings, where to stay, reviews, and tourist information, read Key West holiday planner. Drive from Marathon to Key West in 1.5 hours. Alternatively, you can take a bus. In March, daily temperatures in Key West can reach 79°F, while at night they dip to 69°F. Finish up your sightseeing early on the 28th (Tue) so you can travel back home.